The Green Deal hopes to encourage older homes towards such general insulative upgrades as double-glazing, cavity wall insulation, 300mm of roof insulation and good draught proofing. While insulation upgrades are being made, it is also the perfect opportunity to replace radiators with underfloor heating (UFH) and old gas boilers with new, condensing boilers. The technology – Condensing boilers reduce carbon dioxide emissions and improve household efficiency, resulting in reduced fuel bills. They work on the principle of recovering as much as possible of the waste heat which is normally rejected to the atmosphere from the flue of a conventional boiler. The combustion process in the boiler combines the fuel with oxygen from the air, but as well as releasing heat there are by-products of carbon dioxide and water. The water is in the form of vapour that emits from the boiler’s flue. At the critical temperature, called the ‘dew point’, this vapour will condense into liquid. The condensation releases ‘latent heat’ from the vapour over the boiler’s heat exchanger increasing the boiler’s overall efficiency even more. In order for a boiler to operate in condensing mode the return temperature of the heating system must be lower than the dew point. Radiators sized traditionally to a design flow temperature of around 70°C with a return temperature of 60°C run, in general, outside of a condensing boiler’s range. UFH, however, requiring a flow temperature of 50°C flow and 40°C return can obviously take more advantage of the boiler’s condensing range. It is in these types of property that a system comprising a condensing boiler partnered with a low profile, gypsum based UFH system is ideal. UFH has traditionally had slower response times than radiator systems, but with a low mass, highly conductive gypsum-based floor construction, a very fast response both to warming up and cooling down is achieved. 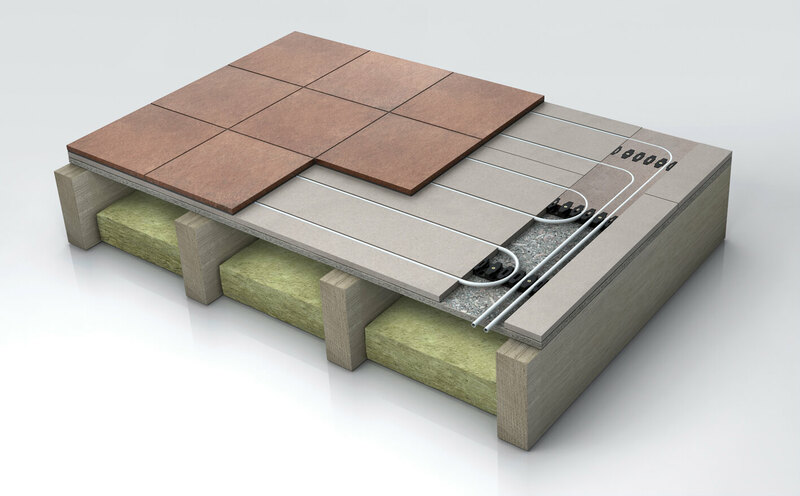 Nu-Heat’s LoPro10®, a composite gypsum construction with one-third less thermal mass than a screed floor will heat up and cool down rapidly and give low thermal resistance and high-density properties that provide high thermal output compared to similar low height plywood and chipboard based systems. Response times in comparable, non-gypsum based products are slower due either to use of a thicker board or a board that is a poor heat conductor. 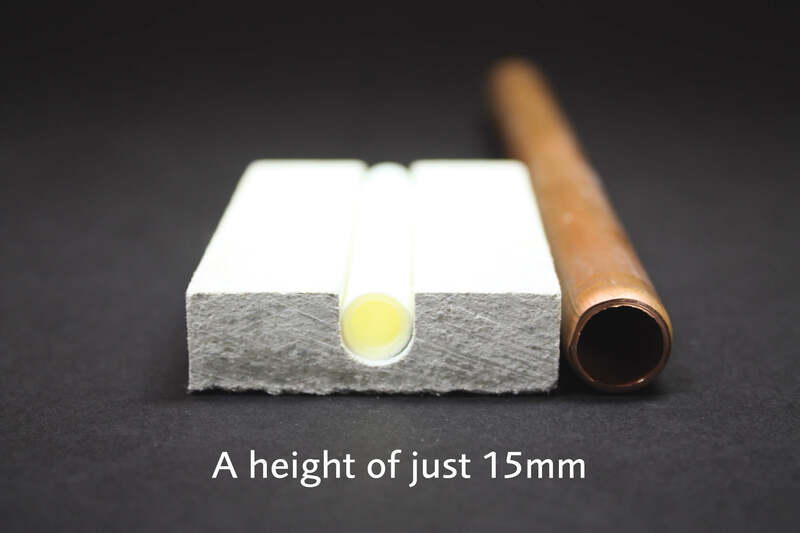 To help meet Building Regulations Part E acoustic criteria, this type of floor construction should provide airborne acoustic reduction on timber upper floors by adding mass – 15.5kg/m². This also means that it feels more solid underfoot than many lightweight floating floors. Room thermostats – provide a major benefit when retrofitting UFH systems as they remove the need for potentially disruptive and messy hard wiring. Wireless stats also provide independent time and temperature control for each room or zone, including a set back temperature function to further improve overall running costs when owners are out at work or asleep at night. This automatically drops the room temp by 4°C within set timed periods and returns it to the desired temperature when required. Running costs – Electric UFH has been used in the retrofit market for many years due to its inherent low floor height build up and until now there has been no equivalent retrofit low profile wet UFH system available. 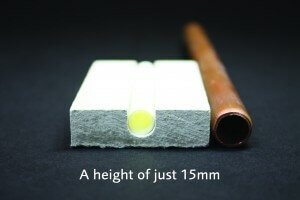 The new low profile UFH system, when combined with a gas fired condensing boiler, costs approximately 4p per kWh to run. In comparison, direct electric UFH systems cost around 12p per kWh, so are about three times more expensive to run. Floor coverings – The aesthetic of the finished floor is likely to be high on your customer’s priority list so it’s important to offer advice on the wide variety of floor coverings available that can achieve the best from their heating system. Contemporary and desirable finishes such as ceramic tiles and limestone, which conduct heat well and warm up quickly, are a good choice and dependent on your customers’ design preference engineered boards, kiln dried hardwood and carpets are also suitable options. 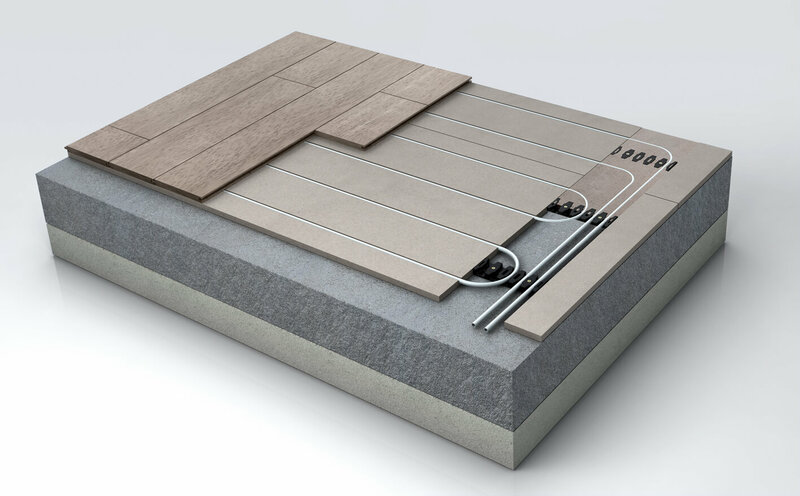 Floor coverings are taken into consideration as part of the design process so whatever the customer’s interior design choices they can enjoy the benefits of underfloor heating with no constraints on floor finishes or room layout.